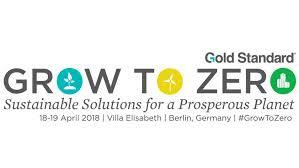 Meet our team at the conference „Grow To Zero 2018 – Sustainable Solutions for a Prosperous Planet“ hosted by the Gold Standard certification body on 18-19 April 2018 in Berlin. Talk with us about corporate environmental and climate action, carbon neutral business strategies, climate smart land use and deforestation free supply chains. If you like to get in touch in advance or during the event send an email to info@co2ol.de.